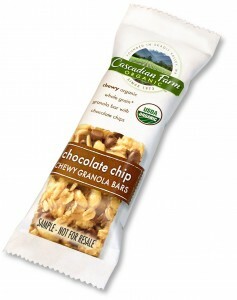 Cascadian Farm is giving away free sample-sized organic Chewy Chocolate Chip Granola Bars through January 30, 2009, while supplies last. It’s the company’s top selling snack bar, and a nice little treat made from healthy ingredients such as organic rice syrup, organic rolled oats, organic chocolate chips and organic whole milk (see the complete ingredients list on the website). Just visit CascadianFarm.com and click on the FREE SAMPLE box. In order to share the wealth, there’s a limit of one free sample per person. You must be 18 years or older and reside in the U.S. You can buy the bars online, and there’s a retail store locator (both are in the Products section of the website). Cascadian Farm is one of the country’s leading brands of organic foods. Therer’s a real 28-acre working farm where it all started, 35 years ago, in the foothills of the Washington’s North Cascades mountain range. You can visit if you’re in the area.